Fall, Winter, and Spring are long gone and it is Summer now which means that there is more sunshine and warmer temperatures to allow you more of a chance to spend your precious time outside with your friends and with your family! Some of our favorite Summer memories stem from 4th of July gatherings– people of all ages crowding around tables that are adorned with plastic utensils and paper plates and bowls of potato salads– impatiently waiting for Dad to finish cooking the BBQ on the grill. Perhaps the BBQ would have been served sooner if Dad had been using the Steven Raichlen Best of Barbecue 30-inch Ultimate Grill Cleaning Brush to clean the grill with before he started cooking. This cleaning brush, popularized by the American culinary artist/grill god, Steven Raichlen, is perfect for any grilling equipment connoisseur what with its 30-in long handle– optimal for anyone who fears being burned by the flames. This defining feature allows for great leverage and keeps you a safe distance away from the fire. Another quality of this brush that is convenient for anyone with a knack for BBQ, is the removable 8-inch wide head with bristles made of fine brass and stainless steel. The brass and stainless steel material prevent the brush head from rusting– ensuring its survival rate– making certain that it can be used for many cookouts to come. The Steven Raichlen Best of Barbecue 30-inch Ultimate Grill Cleaning Brush is simple to use. Use the steel bristle side of the 8-inch brush head on the cast iron and stainless steel grill grates; use the brass bristles on the more delicate enamel. Utilize the metal scraper on the opposite side of the brush head to easily pry off any burnt on debris found on the grill grates. If you are familiar with the Steven Raichlen brand, you know that his expertise will not lead you astray. Not only is this product endorsed by a man with such a vast knowledge of grilling, and what it means to clean a grill well, but this product has also been received generously by customers everywhere. The brush is praised for its safety features. For example, the 30-inch long handle is reinforced by securing metal in the brush’s shaft that affords stability– keeping you and your loved ones from burned fingers. It is also praised for its cleaning results, what with its double head of both brass and steel bristles. This is perfect for whatever mess is being encountered on whichever grill is being cooked in. 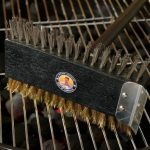 Save yourself a load of hassle by purchasing the Steven Raichlen Best of Barbecue 30-inch Ultimate Grill Cleaning Brush. Your BBQ will taste better and you’ll get to eat it sooner!